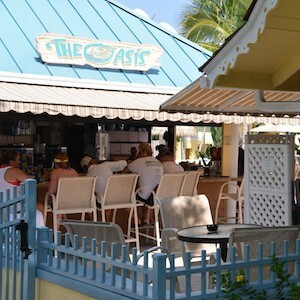 If it’s shady and comes with cool drinks it must be The Oasis pool bar. Your time spent at the ‘Tween Waters Inn will likely include a trip or two to the pool. While you’re at the pool be sure to enjoy the tasty, poolside menu items served in a casual style from the bar and at nearby tables. Spot the blue roof and you’ve made it to the right place. On a recent visit, I enjoyed the best frozen Rum Runner drink I’ve had in many years. My husband and I also shared an order of Fish Tacos that were excellent. If you like Grouper, you’ll find this item a fresh way to serve up some yum. Another favorite item is the Cheeseburger, obviously in paradise, served here, too. — Before you return to the pool for another dip and some sun, take a short walk into the local area near this table… Do this because you’ll find a creatively crafted, swinging bench located between the cottages to just sit on and relax for awhile. Life at the ‘Tween Waters Inn doesn’t get much better than this when you’re spending time at the pool. If you try my recommendations or discover something even better, please be sure to let me know.